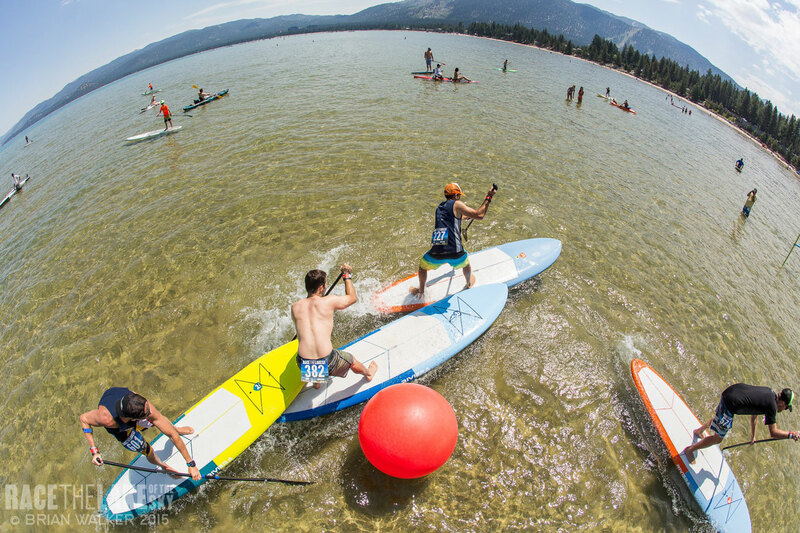 In what has become a true festival of stand up paddling, Race The Lake again attracted hundreds of competitors to one of the most scenic paddling destinations on the planet. As in years past, the crowd was an interesting mix of first timers, weekend warriors and a few very high profile international stars of the sport. While I could easily succumb to the cliché of “stand up paddling was the real winner!” the actual winners were quite clear: Danny Ching and Annabel Anderson, with the duo each completing a clean sweep of the 5 mile and 14.4 mile events. On Saturday, basking in the beautiful northern Californian sunshine, Danny finished the El Dorado course in just over one hour flat, which suggests the course was probably a bit longer than the advertised 5 miles (8kms). Coming home second in the elite men’s division was Australian Kelly Margetts, one of the most under rated paddlers on the planet. Kelly has been a BOP podium regular for the past few years despite pushing into his mid 40s, however he still doesn’t receive the widespread credit many of his peers enjoy. Perhaps that’s due to his incredibly laidback nature. No matter what, Kelly had a pretty good weekend in Tahoe, finishing a close runner-up to King Ching on both days. Rounding out the top spots in Saturday’s El Dorado 5 miler were a couple of guys far younger than both Kelly and Danny: Kenny Kaneko, the SIC champion of Japan scooped third, finishing literally right behind the Aussie, while young charger Noa Hopper from the LairdSUP stable hung on for a 4th place finish just two seconds further adrift. A minute later, the Team Mexico duo of Bicho Jimenez and Fernando Stalla took places 5th and 6th, with the promising Tahitian and 404 protégé Niuhiti Buillard on their tail to claim 7th. Garrett Fletcher, Taylor Rambo and Jeramie Vaine rounded out the top 10. In the women’s it was Annabel Anderson, fresh from a few stitches at the Payette River Games last week, claiming yet another winner’s trophy. Though Annabel did have some company for much of the race, with the tenacious Shae Foudy able to hang on to her tail to be just six seconds behind at the line. The spirited Shelby Taylor, who hails from the States but resides and trains in Sayulita, Mexico, owned the third step of the podium, with Anik Wild, Kim Barnes and 14-year-old future star Erika Benitez fighting for the minor placings a minute behind. As you’d expect, Sunday’s daunting 14.4 mile Emerald Bay course attracted a smaller turnout (165 finishers vs 298 in the 5 miler), however the big names were all still there. 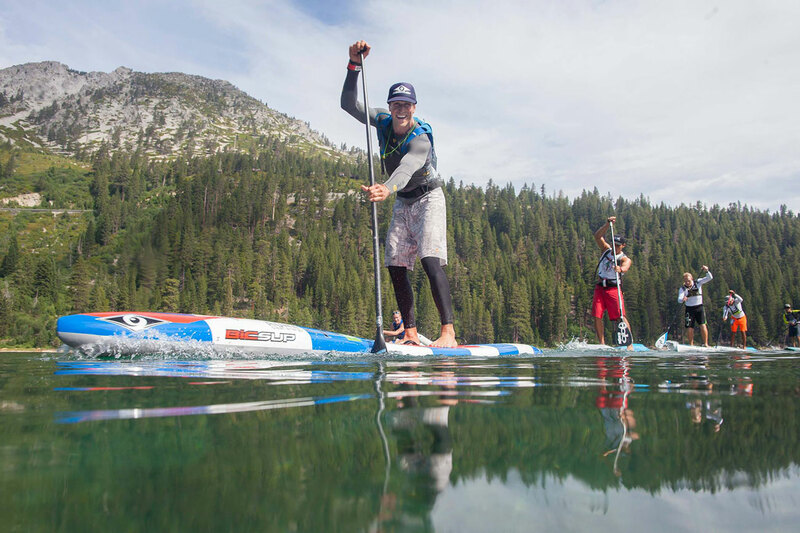 While the sleek outrigger craft filled all the top spots, the fastest of the stand up paddlers was Rob Rojas on his unlimited Riviera weapon, crossing the line in 2 hours 17 minutes. That was five minutes faster than Danny, who once again took out the elite 14′ division on his 404 SUP machine. And in a repeat of Saturday, it was Kelly Margetts claiming the runner-up position again, with another hard fought performance that’s come to define the Lahui Kai team rider. Kelly was just 25 seconds off Danny’s pace at the line, with Chase Kosterlitz, who was absent on Saturday but spent much of Sunday driving the main draft train and keeping Danny’s lead to a minimum, claiming the third step of the podium a further 10 seconds back. Once again the Rogue duo of Fernando (4th place) and Bicho (5th) were right up there, with Nando coming home less than a minute behind Danny and Bicho only another 30 seconds off the pace. 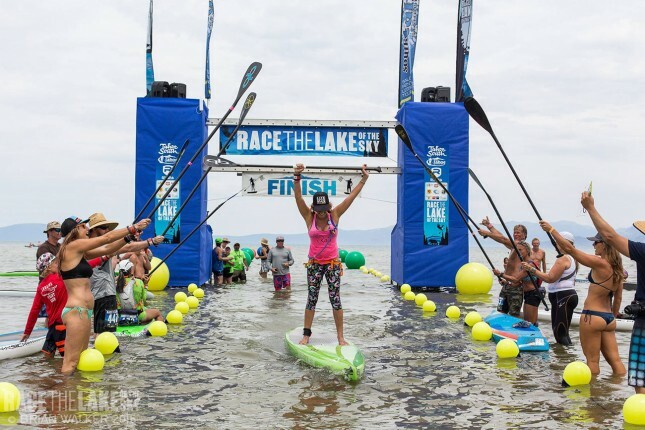 In the women’s race, where the elite ladies were cruelly forced to stick with their 12’6 boards for the 14.4 mile (23km) journey (why do guys get to race 14 footers while women have to paddle 12’6 boards in America? ), it was Annabel Anderson who saluted once again. This time the Kiwi had a bit more space to enjoy Lake Tahoe, with Shae Foudy getting dropped. While a second runner-up finish in two days is quite an achievement for the maturing youngster, she was still almost four minutes behind the world number one. Shelby Taylor snagged herself a podium double, claiming third once again after outlasting Kim Barnes by the narrowest of margins. In the battle of the groms, Kalia Alexiou (5th) upstaged Erika Benitez (7th), with the experienced Kelsa Gabehart (6th) splitting the duo. Race The Lake of the Sky wouldn’t be complete without the epic SUPCROSS event, a short, sharp and mildly choatic event that South Lake Tahoe has become famous for. Modeled on the Boarder Cross/Ski Cross events in the Winter Olympics, SUPCROSS comes complete with electronic starting gates and all. The SUPCROSS was held on Saturday afternoon, shortly after the El Dorado 5 miler, and while a few of the big names opted to have a rest, there was still a lot of speed, agility and carnage on show. With a dozen different divisions, there were a lot of winners in the SUPCROSS, however the big two that saluted were Noa Hopper (winner of the elite men’s contest) and Kelsa Gabehart (elite women). 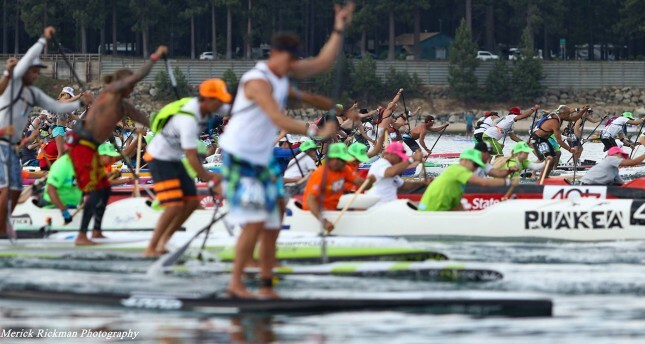 I imagine the awards ceremony took almost as long as the race itself, with dozens of trophies awarded to paddlers across numerous races, board classes and age divisions. There were also a few special awards handed out, including a couple of agile youngsters and an inspirational Danny Ching being recognised for his contributions. You can get the FULL RESULTS over on the official site. All in all seems like Lake Tahoe and Race The Lake of the Sky delivered once again. Great to see hundreds of paddlers out racing, and also very encouraging to see 100 women and dozens of kids on the start line for Saturday’s 5 miler. – Conditions: Flat. It’s a lake.